One of the main reasons the owners recently moved into this property in Lindfield was because they always loved the idea of a big, modern kitchen. They purchased a tired 1970’s property because they saw the potential for a spacious, multi-functional kitchen, dining and living area and also noted that the garden was big enough to extend outwards also. Plans were drafted to transform the ground floor, the kitchen and dining room would be knocked through, and the living room separated off with a new dividing wall. Across the back of the house they planned to build a new, four-metre-wide extension with bi folding doors. These plans soon came to fruition resulting is a light filled, L-shaped kitchen-dining and relaxation space, with an opening right out to the garden. 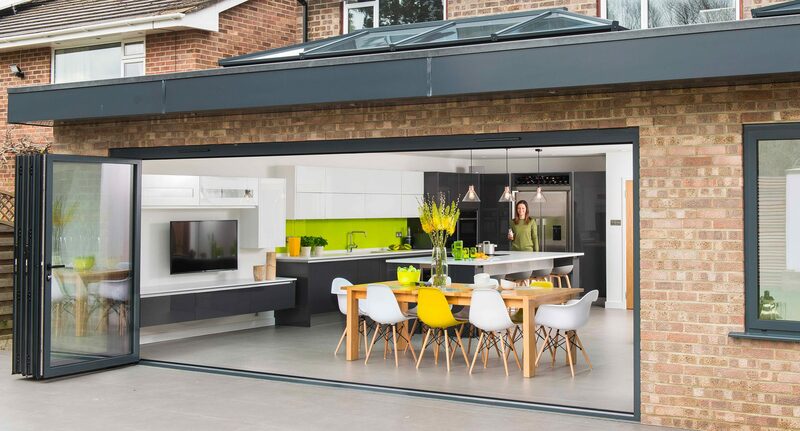 The owners were determined to use wider-than standard bi folding doors, so after visiting the Ideal Home show in London they were more than happy to install our premium XP View bi folding doors, two sky-line roof lanterns and a new window within their impressive new extension. The new extension is flooded with light thanks to the two striking feature skyline roof lanterns. The skyline roof lantern contains minimal framework and boasts modern clean lines in keeping with the rest of the kitchen. The the glazing on the front extension also boasts a crisp, sharp look that can be enjoyed and admired by visitors and most importantly the homeowners who have perfectly summed up their new living space ‘we both really enjoy just being at home now- it’s perfect’. Our British made folding and sliding doors and glazed roof products can help you create a perfect living space just like this one. You can learn more about our bi folding doors by clicking here, and more information about our roof lanterns/skylights by clicking here. Alternatively, please have a look through the rest of our case studies for more inspiration or visit one of our showrooms to see our superb products first hand.